Social Security Disability Insurance (SSDI) is a government program that pays monthly benefits to applicants with physical/mental disability. The average monthly SSDI payment for an individual is $1,132, and $1,919 for a family. To qualify for benefits under the SSDI program, several criteria regarding the individual’s medical and non-medical conditions must be met. Applications for SSDI are assigned to the office of the state agency, then to the social security administration, and finally to a specialized disability examiner. The Compassionate Allowances List is intended to expedite petitions for applicants suffering such severe impairments, including early-onset dementia. SSDI applicants can receive benefits through the Presumptive Disability program while the approval process is underway. 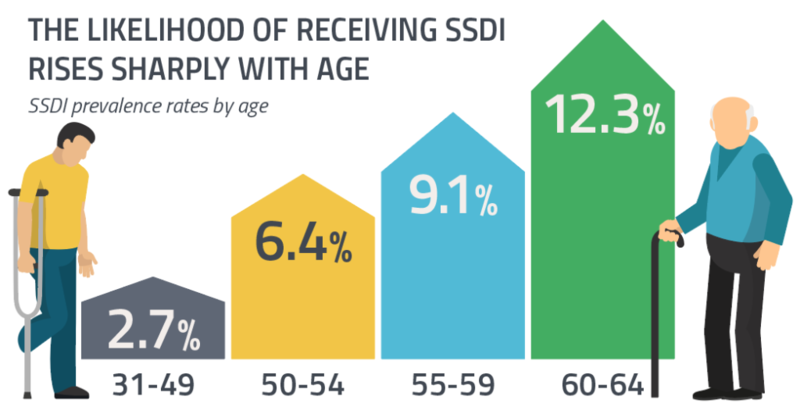 Social Security Disability Insurance (SSDI), commonly abbreviated as SSD and SSI, is a Social Security program that pays monthly disability benefits. This is paid up to a person’s retirement age, and to any applicant who is disabled or blind and who cannot work. Since 1956, the SSDI has been a safety net government program that helps people whose physical or mental disabilities are so severe that they cannot undertake substantial work. There are currently 8 million SSDI disability benefit recipients in the U.S. The average monthly Social Security Disability Insurance payment for an individual is $1,132, and $1,919 for a family. These constitute half or less of the wage the individual earned prior to their disability. And while there are several factors that qualify an individual for these monthly payments, the predominant factor is that a person must have first paid into Social Security by way of their payroll taxes. The individual’s condition must be certified as severe. 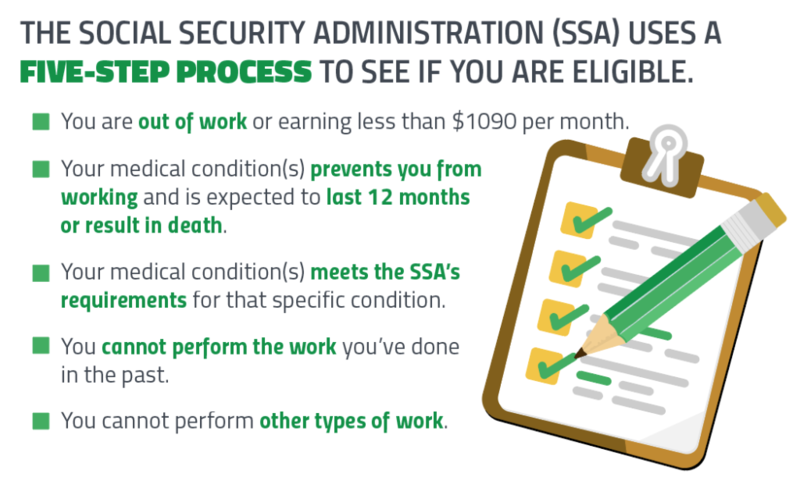 The Social Security Administration (SSD) defines “severe” in terms of how much the disability prevents an individual from performing their activities of daily living (ADLs). For children, the definition extends to how much the disability prevents a child from participating in “age-appropriate” activities; for adults, it reflects on how much the person is prevented from working. In an effort for the SSDI program to ascertain that a disability is permanent, 12 months must have lapsed after onset of the disability for disability benefits to kick in, even when the disabling condition is severe. Until that period is met, a “durational denial” is issued (which can be appealed at an SSD office). The disability must be severe to the point where the individual cannot go back to any work type performed during the last 15 years. In addition, it must be severe enough that the individual cannot in any way use their special skills to perform work “of any kind”. These high-standard tests are frequently contested on “appeal”, for it is not easy to claim that the individual cannot do any work. An individual who is at first denied however is granted the opportunity to appeal the denial at a disability hearing. These are handled by a disability examiner initially and, if challenged, by a hearing judge in an appeal process. It is incumbent on the individual, through the presentation of medical records and physician certifications, to demonstrate, at an SSD office, that gainful work and income is not possible. The most conclusive rating an individual can be given is a “sedentary rating”. That means that all work is ruled out other than work that requires minimal exertion and that can be accomplished from a sitting position. Such ratings are given by way of what is known as a physical RFC (residual functional capacity), or a mental RFC, referred to as an MRFC. These RFCs are then run down the list of jobs the claimant held over the past 15 years to determine whether any such job can still be maintained by the now disabled claimant. Claims for SSDI are won or lost to a large extent depending on the voracity of the medical documents and certifications that a claimant can produce. This is why people intending to submit a claim are encouraged to first update all their records and, whenever feasible, to have a disability lawyer or representative put forth their case on their behalf. Although SSDI is federally-funded, applications for disability benefits are assigned to the office of the state agency responsible for making disability evaluations. This then is followed up by The Social Security Administration (SSA), and thereafter by a specialized disability examiner for claim assessments. The first thing the examiner does is to send out for medical records and other information to the entire list provided by the claimant with the application. That includes physicians, medical centers and others who may have played a part in diagnosing or treating the disability. Only upon receipt of said information will examiners begin their evaluation work. That process can take months and depends to a large extent on how fast people respond to the examiner’s requests. There is a Social Security Disability listing manual, known as the blue book, that examiners routinely refer to determine the claimants’ physical or mental condition. That manual goes under the title “Disability Evaluation under Social Security”. It lists strict disability criteria for impairments, and it constitutes a critical tool in the process. A claimant’s medical records must correspond strictly to the definitions provided by the blue book. In many situations, claimants will not be approved merely on the strength of a particular listing in the blue book. When disability examiners have doubts regarding the voracity of a claimed condition, they resort to an assessment method known as “sequential evaluation”. The Social Security Administration (SSA) has a list referred to as the Compassionate Allowances List (CAL) that is intended to expedite petitions from applicants suffering such severe impairments that their cases would invariably match one of the SSDI criteria for eligibility. It is not up to applicants to apply for SSDI compassionate allowances. Instead, SSDI examiners review all disability applications and then determine which of those may qualify for expedited compassionate allowances. Such SSDI cases are thus put on a fast track when the claim made by the applicant (or an authorized person on behalf of the applicant) is in accordance with the Social Security Administration’s analytical model (for example, a positive biopsy for one of the cancers on the CAL). Applicants are encouraged to write to the Social Security Disabled Insurance office with adding on the top of their applications the words: “Compassionate Allowance Claim”. With proof of the medical condition sufficing for determination, their cases may be processed in far less time than otherwise. Based on the minimal information that is required to determine if an application qualifies for compassionate allowance consideration, one would think that such a claim would take only a few weeks to pass through the process. In reality however, and mostly because physicians and medical centers commonly take weeks or months to respond to queries, an individual’s claim can take much longer. The thing to do therefore is to provide all pertinent medical records with the application when the application is submitted to the examiner. If the applicant can do that in person, all the better. Unlike other claims made for Social Security Disability Insurance benefits, “compassionate allowance” claims can take only a few days or weeks if the applicant is properly documented and the application is designated a “Compassionate Allowance Claim”. In such cases, the compassionate element of the claim carries a lot of weight. A medical consultant, employed by the Social Security Disabled Insurance, is nevertheless required to evaluate and endorse a CAL claim prior to approval. It is also worth noting that in all other situations, a compassionate claim is the same as any other claim made under the SSDI protocols. For example, the waiting period, the 15 work-years, and other regulations that are established by federal regulation, cannot be waived for compassionate claims. Those however can go to the SSI appeal office. Finally, it is critical to submit the correct type of medical information to expedite the process. For example, if you have a tumor, the most relevant medical record to submit with your application is the biopsy report, together with a hospital discharge summary or letter from your doctor. Those documents would be enough to ensure a speedy process for your claim (as long as your cancer is one of the tens of dozens of cancers listed on the CAL list). That would be sufficient evidence to get a disability approval through the CAL program. Upon applying for benefits to SSDI, any person with a terminal illness can have their application go through the SSDI process speedily and with sensitivity to the person’s state of mind. To cite an example of how the process works towards catering to possible emotional distress, TERI patients are not notified that their claim is being administered under the terminal illness designation. In addition, the patient doesn’t need to spell out on the application that their illness is terminal. Terminal illness cases are those that are known to end with the claimant’s passing. The SSDI examiner, commonly someone within the office of the Disability Determination Services (DDS), notifies the TERI program that a Hospice program is providing care for the patient, or that a physician or other medical consultant had declared that that the illness is expected to result in death. Alternatively, the examiner can notify the TERI program if the patient’s disability claim is based on the fact that the patient has ALS (amyotrophic lateral sclerosis), also known as Lou Gehrig’s Disease, or AIDS (acquired immune deficiency syndrome). In cases like those, the patient is brought routinely into the TERI system. The vast majority of patients with dementia are diagnosed when they are in their 70s and older. Early-onset Alzheimer’s (or early-onset dementia) is thus a term used when Alzheimer’s disease appears at an age lower than 65. A diagnosis of early-onset dementia can have a difficult impact on individuals and their families – especially in terms of their financial resources and health. These individuals and their families are suddenly thrust into an alien world that is fraught with confusion and dire outcomes. One of the relieving factors when that occurs has to do with Social Security Disability Insurance, for SSDI has added early-onset dementia to its Compassionate Allowance List (CAL). That makes it easier to qualify for SSDI benefits, and it automatically places a claimant’s application on a fast track as well once they apply. Like other claimants, the first such prerequisite is that the applicant must have in the past contributed to the Social Security system over the long-term via the applicant’s payroll taxes before retirement. The applicant must have thus paid into the system during 5 out of the last 10 years or, alternatively if the applicant is too young to have accumulated all those working years, the applicant must have worked and paid payroll taxes for at least half the years since their 18th birthday. The applicant must also get their medical condition to qualify under the general SSDI guidelines. That means that the examiner who reviews a claimant’s application will compare the severity of the condition to conditions listed in the blue book, formally known as the SSDI Impairment Listing Manual. The blue book does not have a specific listing for dementia. However, there are trigger conditions or risk factors that may have caused the applicant’s dementia. The applicant is thus encouraged to apply under the auspices of those particular conditions that are listed in the blue book. The key is to examine that list in its entirety and determine if the applicant’s condition matches any of the listed conditions. Once that determination is made, the dementia-impaired applicant, like all other applicants, needs to supply medical records, lab results, physician letters, and any other documented item that can better persuade the SSDI examiner. Because the person with dementia may not be ideally suited to actually complete the application, they can appoint a legal guardian or any other adequately authorized person to act on their behalf. 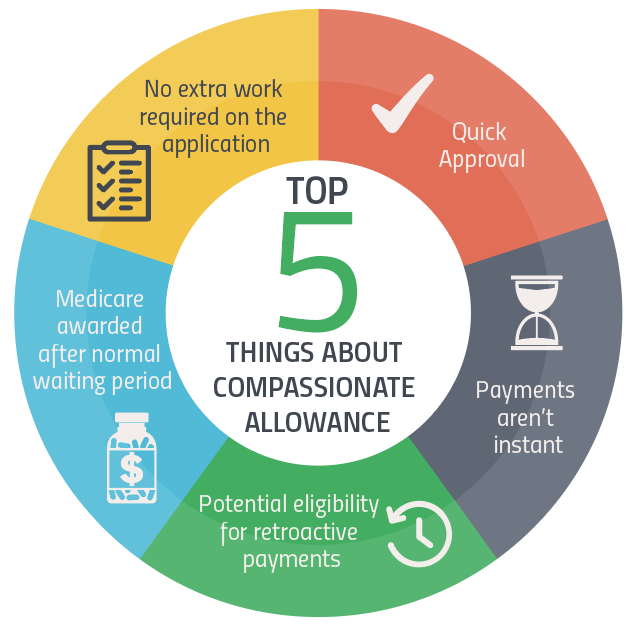 Without the benefits that accrue to a compassionate allowance application, a regular application normally takes 3 to 6 months before the applicant hears back from the examiner. That period of time is cut down to a few weeks only, sometimes to a few days, if the person’s application is within the compassionate allowance guidelines. This allows individuals in dire need the ability to access these SSDI funds more readily. Quick Disability Determination (QDD) is another method that the Social Security Administration (SSA) uses to speed up SSDI claims. The Social Security Administration has at its disposal a state-of-the-art software program that assesses online applications to highlight those factors that increase the probability of a claimant’s eligibility for disability insurance benefits. Once an application is flagged, it is dispatched to a special Quick Disability Determination committee for review and final determination. Unlike the regular SSDI determination process, under the QDD protocols, a disability examiner can approve an application without the need to request that a medical specialist or consultant review the applicant’s medical records. Applicants may thus be approved for SSDI benefits within 20 days, subject to your medical documentation being up to date and complete. Often times, applicants for SSDI benefits are in a financial bind, perhaps facing fast accumulating bills and other emergencies. Waiting for the required months before an application to SSDI is approved can thus be beyond what a claimant can endure, possibly putting themselves and their families at risk. It is incumbent on applicants to demonstrate that their claim rises to the required SSDI eligibility standards. They meet the means of income test of the Supplemental Security Income (SSI) program, i.e. that their total net worth comes to less than $2,000. If the applicant qualifies for presumptive disability, they will either receive cash payments or they may qualify for Medicaid to help mitigate medical expenses. Cash payments that may be disbursed are paid for a period not to exceed six months, or up to the time when their regular Social Security Disability application is approved if that occurs prior to the end of the six-month period. In summary, the Social Security program provides disability benefits, called SSDI, to those who can no longer work because of a serious medical condition. These benefits can be a lifesaver to some individuals and families – providing assets and resources during difficult times often accompanied by significant health expenses. Make sure you find out if you or a loved one might qualify to receive these benefits.